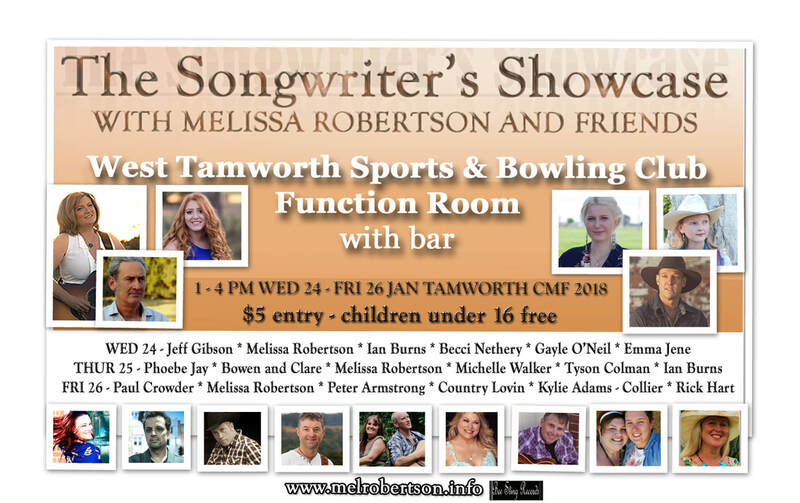 ﻿﻿﻿ 'The Songwriter's Showcase with Melissa Robertson and friends' will be in it's third year at The Tamworth Country Music Festival in 2016. To be held at the newly refurbished Econo Lodge (Frog and Toad) on Sunday 17 January from 10 am - 5.30 pm. 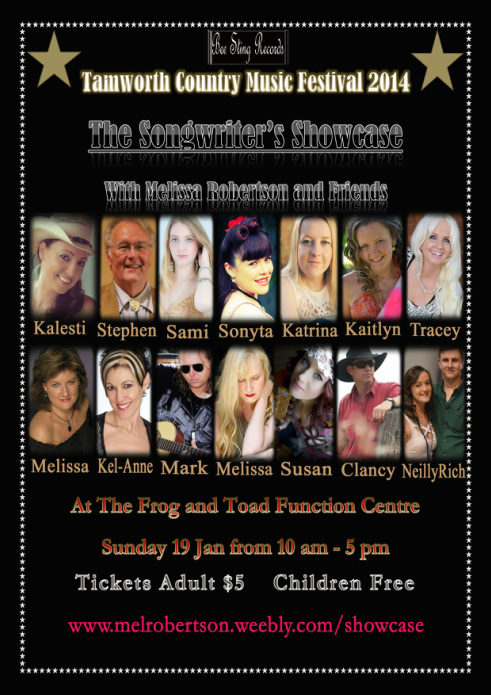 With an energetic and engaging line-up of Songwriter's and new talent including : Alice Benfer, Becci Nethery,Michelle Walker, Emma Jene , Kayla Dwyer, and Sherrie Mace. 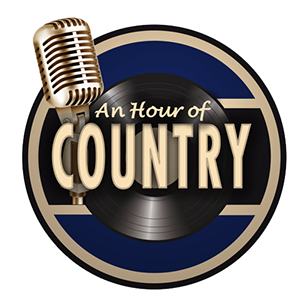 With some favourites from last year's show including: Susan Lily from SA, Tracey Davis Band from the gold Coast; Tamworth's own Wendy Wood who is back as part of Two Gals with Carolyne Moris, Gary Daniel also form SA , and the host of the show Melissa Robertson from the Central West Of NSW. We also have internationally accliamed Country Music Artist Don Allen , One of Australias's favourite Storyteller Songwriter's John O'dea, and the newly formed duo Grazy's Country. This Showcase with ﻿﻿new and familiar faces is bound to be a big hit with Country Music Fans. An all day showcase on Sunday 17 January for only $5 entry for adults children under 16 free. Beginning at 10 am and running through to 5.30 pm at Econo Lodge (Frog and Toad) in airconditioned comfort with a licensed bar and light meals available throughout the day. We hope to see you there for more information please contact Melissa Robertson @melrobertsongs@hotmail.com or visit http://melrobertson.weebly.com/showcase.html . A recent MusicOz and ASA finalist, singer-songwriter Melissa Robertson is becoming known for her country/folk style songs. - Susan Jarvis (Capital News, January 2013). having fun. Be ready for a memorable experience! For all other Tamworth gigs please click on above link. bush ballads followed by Stephen Cheney, an international performer and singer/songwriter with over 45 year’s experience. Two of Becky Cole’s Shiny Stars, Sami Cooke and Sonyta Trahar along with new faces Melissa Rose Holt, Katrina Burns and Kaitlyn Thomas will take us through the morning. Tracey Davis will end the morning show with her band performing songs from her new album. only $5 per adult with children free. We hope to see you there.